Most eagerly awaited collection of the year for me so I'm starting a thread now. On a side note, I look back and I still can't get over how much I really like the green/white kits from 2017. The polo that Tsonga wore and crew which Thiem and Zverev rocked were fantastic. Last years Navy and orange (ish?) was cool too. The one that I really did not like were the 2016 zebra Y-3 collab. But there were quite a few who loved it so just goes to show how tastes differ. Which one is your favorite, J? It makes the US open barricade collection look compelling. My only concern is usually the RG collection has the tournament logo... so maybe this is just a practice top? I always anticipate this collection as well. 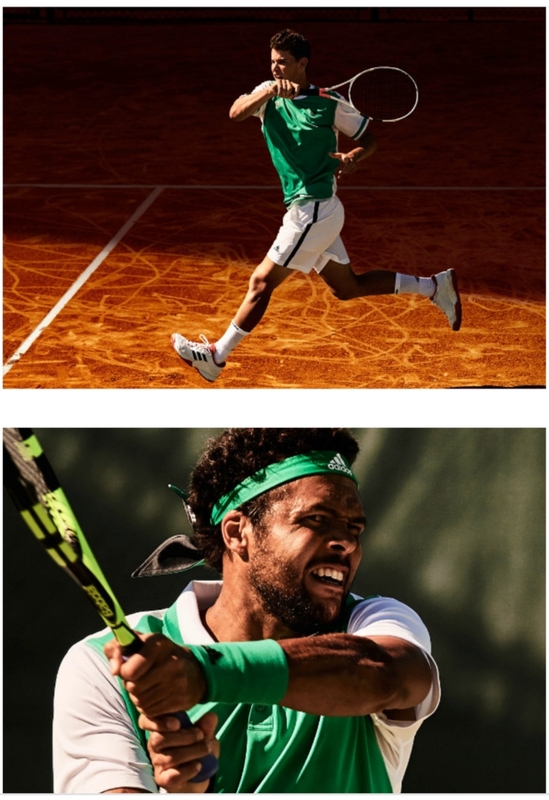 There is a new collection on Adidas’s tennis page they are promoting and on social media. There is no RG collection this year. The line they are promoting today on social media is for the French Open. A lot of it is on UK Adidas. I am sure TW or at least TWE will stock it soon. The shoes tie the outfit together. Also, that shirt with simple white shorts will look very good. Pretty versatile as a whole. I'm with you. Not a fan of this either. 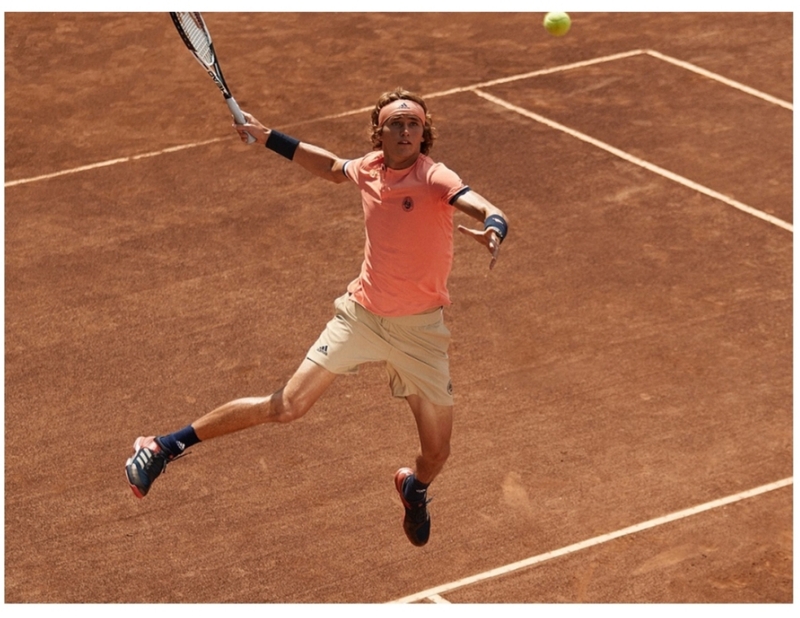 I believe 2017 and 2018 were amazing kits by comparison (Rolland Garros insignia was a plus as well). The jackets really looked good as well especially the dark one (Thiem). I wasn't a fan if the Y3 collab in 2016 though. I agree; especially 2017 was cohesive and had the 'right vibe' for the tournament. Pretty boring so far. Nike's new collection is way more appealing to me. I like it anyway. Hopefully see more of the men's line soon. 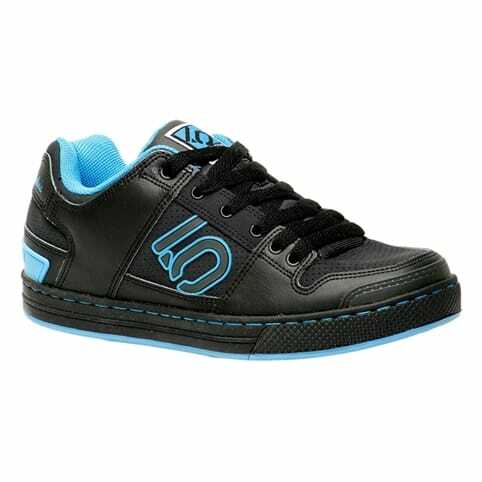 Those uber 3's look nice though. Thanks for posting. It looks like adidas is following on under armour steps in bringing gym looks to the tennis courts. Not my style at all. What do you mean by "gym looks"? It's a slightly safe and simplistic look but I personally like those kinds of designs, and you can't really ever go wrong with those. I think that blue and black combo should stand out nicely against the red clay. I also find it totally uninspired. Disappointing but oh well. This makes me a bit sad. Adidas RG line has been something to look forward to every year and like others have said; the past two years have been great! Doesn't look good, looks like a night gown. I think Adidas entire line this year might have some sort of blue color in it, like their Play for the Oceans campaign. Might be wrong though. The Adidas Men's outfit looks standard and like one user said wouldn't be too flashy worn recreationally. Everything that Andy Murray with under armour logo on it: that's a gym look. She used to wear the Stella line. Is adidas no longer paired w/ them? Which are the main characteristics of that look? Be specific. "Doesn't look good to me" is not a characteristic, but an opinion. I always thought the clothes looked like tennis clothes to me. Is it because it doesn’t have a collar ? I think he’s getting at is that it’s a plain crew with little to no design. Can't help but agree with the thread consensus: this is a very disappointing line. Maybe my expectations were too high after 17 and 18 collections. I have no idea, but the poster is a known Nike fanboy (the user name and profile pic tell the story), so I don't expect him to give any sensible answer. What is it that you don't like about the blue outfit posted (head to toe, including the shoes)? In all fairness, expectations doesn’t really need to be high at all in order to be disappointed by this line. Agree that 17 and 18 had me expecting something great, or at least something with the RG logo. And the parley line was ambitious and great also. This is just...as I believe someone else here has said - plain. The graphics, colour choices, even the lack of priority Roland Garros branding, it's a big step down from the normal flagship Roland Garros line that Adidas has been doing the last few years (imo). Even the cut looks a bit dull but could be hard to assess that without seeing it on the players. Maybe the initial photos are misleading. There is nothing wrong with blue per se (we saw it used well in January) but here it is used in a mediocre fashion (again, imo). I could be a victim of high expectations, but the Adidas RG lines in the last few years have been used to break new ground visually whereas this looks more like an Adidas club line. What I still want to know is what the range is like from a performance standpoint. Do you think you will buy the whole outfit, or just some elements from the range? Hahahahaha, this is too funny. Please check my older posts to see how much of a fanboy I am, even though I do believe the Air Tech Challenge II is the sweetest tennis shoe ever designed. 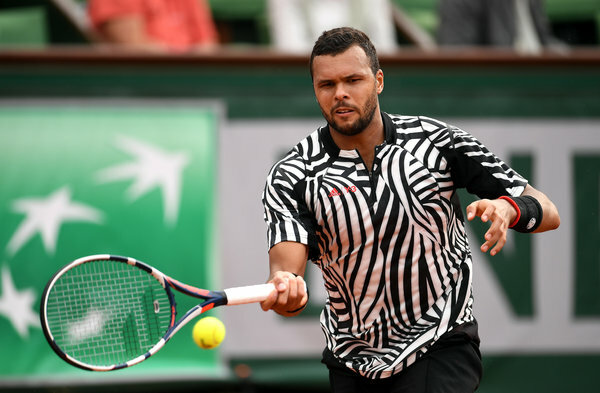 Regarding what a gym look is, I'm gonna use one of my favorite saying from Beavis and Butthead: "if you don't know dude, I'm not gonna tell you"
Tsonga looks ok, maybe light gray shorts would be better. Totally agree. 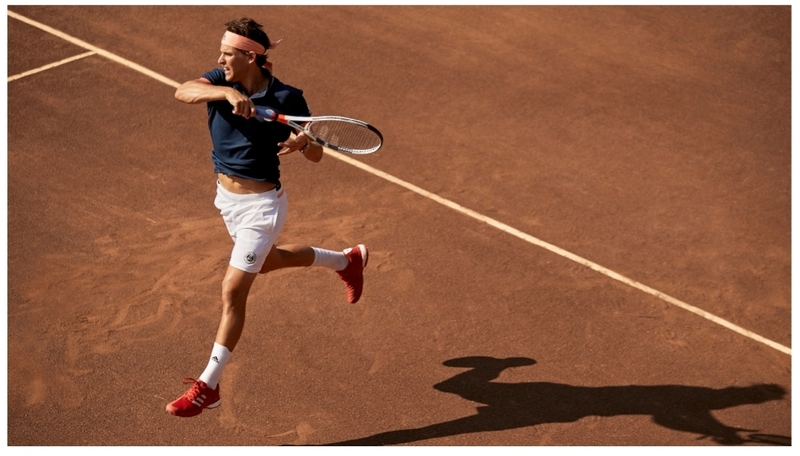 The 2017/18 Roland Garros adidas lines were arguably the best lines of each year in the whole sport. This isn't bad, but it doesn't measure up to the standard they had previously set. The truth is that actions speak louder than words. As for "you are not going to tell me" I saw that coming from a mile (or several thousand) away. The fact that you have no idea that there are obvious differences between the above outfit and anything that Andy has worn from UA speaks volumes about why you would say it in the first place. I will caveat my post by saying that the previous three seasons were indeed very high standard to clear, however I don't judge based on comparisons, but on its own merits. The colour is absolutely beautiful blue (and they have a couple of others which can satisfy a broader range of tastes) which will pair very well with some major staples in everyone's tennis wardrobe (greys, whites, dark blues). Especially with white shorts it will be both creating interest and staid enough to not scream "wannabe pro". The asymmetric detailing is in line with the recent trend with Adidas for that both as functional and visual cues, and it is actually detailing with layered intensity, which is not quite visible in that photo and is also a nice touch and a sign that some thought has gone in the execution of it. That is one of the points I disagree with you (that it looks like their club line), as their club line lacks details. Of course, they will differ in the materials used, as it is always the case, if that is going to be their top line. I will be buying the shirt (polo, if available) for sure, as per my description I consider it both versatile and with enough visual interest and intend to wear it with white Barricade shorts. For the shorts: I think the combination with white shorts is superior in every way, so I don't have a need for them. The shoes are U3s which don't fit me like I would like, so I will pass, but otherwise I think that they complete the outfit in a way that wouldn't be quite there without them (especially with the black shorts). I am in the market for SCB, so I will probably buy those in the same blue (and white) colour.